More stories on the NEWS page . . .
An E-Newsletter is published each month, including upcoming activities and an event listing. To “READ ALL ABOUT IT”, please CLICK HERE to download your copy. More notices on the NOTICE BOARD page . 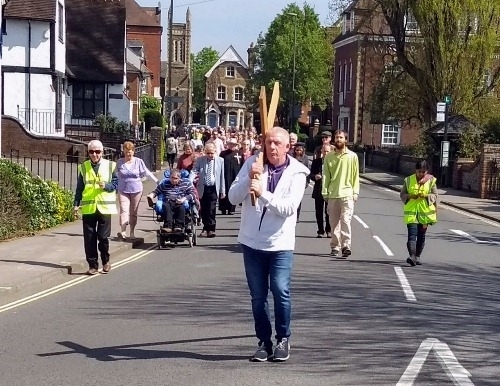 . .
On a beautiful Spring day, many of the town’s Christians gathered in The Hart at lunch-time on Good Friday, setting out in silence on the annual Walk of Witness around the town centre. The walk ended in St.Andrew’s churchyard, where a short open-air service was held. The congregation at All Saints Church, Tilford are looking forward to welcoming the Revd.Neil Fairlamb, who will be licenced for his new ministry during the evening service (6:30 p.m) on 15th May. He will replace All Saints’ much-loved parish priest Canon Heather Humphrey, who sadly died in February 2018. 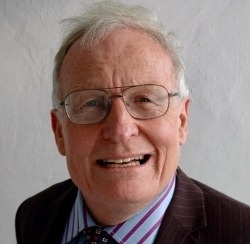 Neil comes to Tilford from North Wales where, since 2003, he has served as Rector of Beaumaris and Ministry Area Leader of Bro Seiriol in the Archdeaconry of Anglesey. Neil was ordained in the Diocese of Southwark as a non-stipendiary minister, before moving into stipendiary ministry in Wales, becoming Rector of Beaumaris in 2003. “Yvonne and I have been very happy to have spent 20 years in Bangor Diocese. We married just as we started in Meirionnydd and have made many friends in the parishes and through wider ecumenical links including Ynys Enlli and the Roman Catholic Church’s outreach activities from St.Beuno’s and Loreto. The new post in Surrey will be an opportunity to care for a traditional but outward looking village community and to part of a busy town ministry in Farnham. I am so fortunate to be in good health and to be given an opportunity to continue ministry into my 70s, sharing life’s journeys with people - in solidarity with their joys and sorrows as we make our Christian pilgrimage together. As in previous years, Churches Together in Farnham marked the annual Week of Prayer for Christian Unity by daily prayers during the week, with a Service of Christian Unity on Sunday 20th January 2019. Around 60 Christians from churches across Farnham gathered for the annual Service of Christian Unity; held this year at St.Thomas-on-the-Bourne. The service was led by the vicar of St.Thomas, Revd.John Morris, assisted by Bob and Margaret Skinner from Weybourne Community Church, Beth Davenport from the Spire Church, Revd.Hannah Moore of Badshot Lea and Hale, and Michael McDonnell from the Catholic Church of St Joan. The service material originated from the churches of Indonesia and the theme of the service was Justice. A collection was taken to support Wycliffe Bible Translators; the service was followed by networking between members of different churches over a fine array of refreshments. The Week of Prayer included morning prayer meetings each day in churches across the town, including St.Joan’s, Tilford Rd; the Quaker Meeting House in Tilford Rd. ; St.Andrew’s in Church Lane; St.George’s in Badshot Lea; Farnham Vineyard in Union Rd; St.Thomas-on-The Bourne; and The Spire Church in South Street. 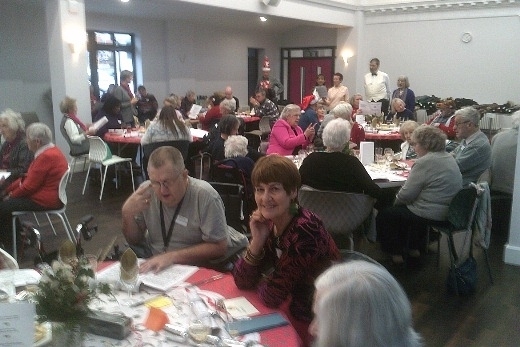 This year the celebration took place at a sparkling new venue, the recently refurbished Memorial Hall off West Street, where guests were treated to an excellent two-course meal including roast turkey with trimmings, Christmas pudding and wine. The event was attended by both the Mayor of Farnham and Mayor of Waverley, who joined the carol singing and socialised with guests and volunteers. This annual celebration is made possible through the generosity and good will of our local community. This year, support was received from Bourne Show, Hale Carnival, Morgan’s Butchers, Sainsbury’s and Waitrose. Our chef was Lou Snape and the lunch was coordinated by Churches Together in Farnham. CTF holds its A.G.M. each autumn. This year’s meeting took place on the evening of Thursday 18th October 2018 starting at 7:30 p.m and ending by 9:00 p.m, giving those attending a chance to meet each other afterwards over a glass of wine. The main business of the meeting was to receive brief updates on the wide range of Christian activities that support our local community through the year, and to meet some of those involved. An opportunity for church leaders, particularly those new to the town, to share their thoughts. You can download your copy of this year’s A.G.M Minutes from the following link. Download A.G.M. Minutes (2018) here. On 2nd September, Farnham's new Spire Church held its inaugural service at Farnham Methodist Church in Farnham town centre. The new church is a merger of Farnham United Reformed Church and the Methodist Church. 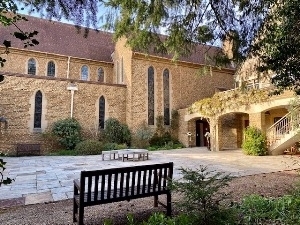 The name for the newly merged “Spire Church” was decided in May 2018, following nearly two years of detailed discussions. For some time, The Spire Church will use both URC and Methodist church buildings, particularly during the planned major remodelling and refurbishment of the URC building. Pilgrim Project. The major work in the URC building is being undertaken as the “Pilgrim Project”. Consulatation, planning and fund-raising for the project has been in progress since mid-2017 and the work will take place in a sequence of phases. The Churches Together in Farnham directory provides contact information for CTF Officers, Member Churches and Associated Organisations. Download HERE for local printing (PDF format; file size 38,415) or find out more on the “CTF Directory” page. Churches Together in Farnham record with sadness the death of dedicated and committed Christians who have played important roles in our support. Please CLICK HERE to see recent reports.